Pros: Blades that are playable for a willing single-digit. Beautiful shaping and top-quality satin finish. 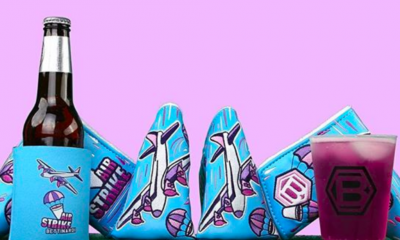 Cons: They’re pricey, about $1200 for a seven-club set. 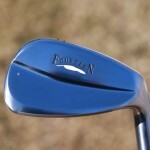 Bottom Line: Even professional golfers are moving away from blades toward more forgiving irons. But if you’re a blade loyalist, or want to be, these are a must-try. 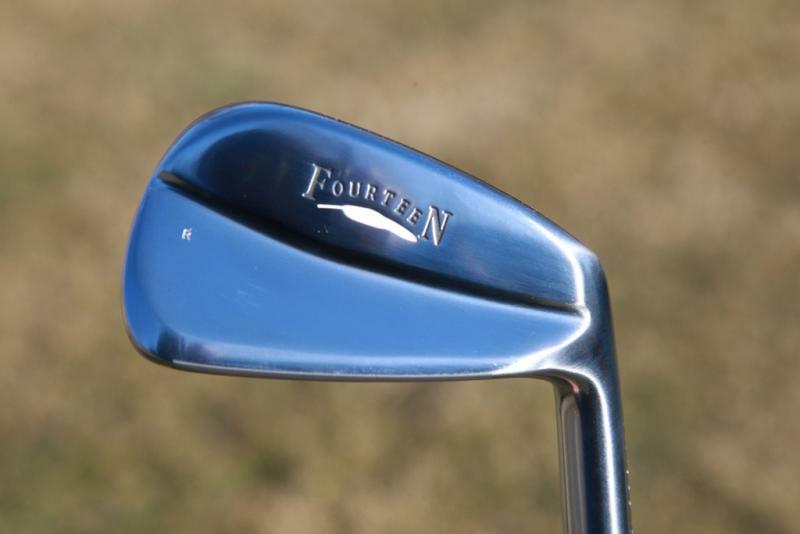 Fourteen Golf was established in 1981 as a Japanese club maker that hand-crafted forgings for some of the best players in the world, including the 1987 U.S Open champion Scott Simpson. 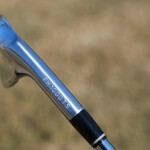 As word spread about the quality of Fourteen’s clubs, the company introduced its own product under the Fourteen Golf banner. 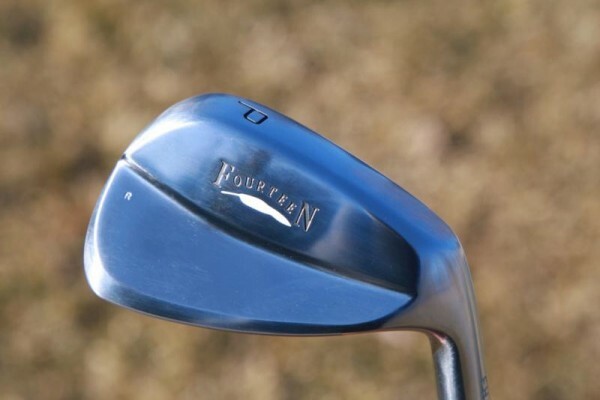 In 2002, Fourteen Golf was thrust into the spotlight when Ernie Els won the Open Championship using a Fourteen utility iron Since that time, the company has continued its growth, and has a tour presence that includes Ryuji Imada, John Mallinger, Chad Collins and Arjun Atwal. 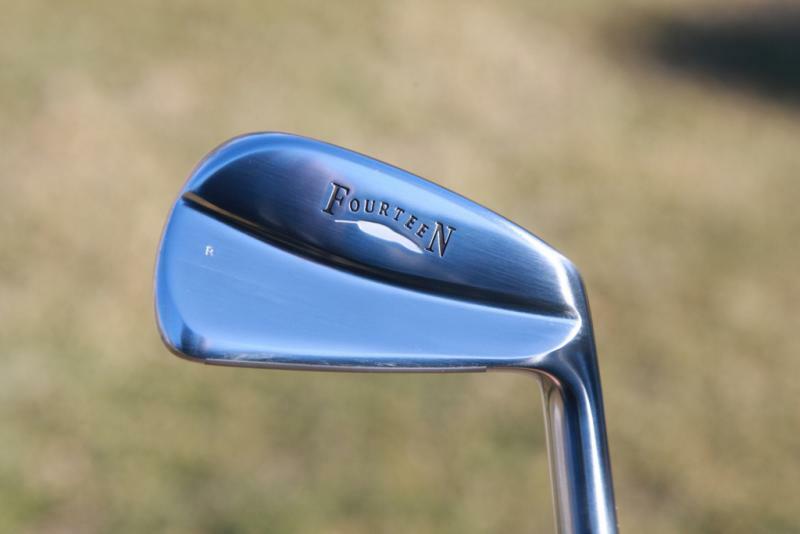 Click here to see Fourteen’s new iron models and golfer discussion on the company’s Facebook page. While other OEM’s race to be one step ahead of the competition, Fourteen Golf has built a following based on the simple idea of equipping golfers with the best 14 clubs possible. 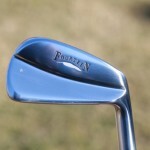 The FH-1000 irons are representative of this idea to the nth degree. 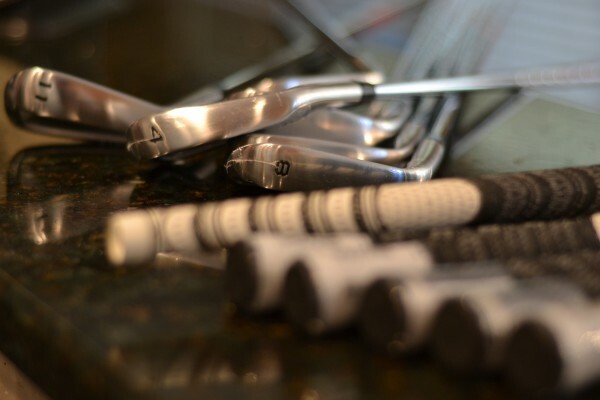 They’re true players iron designed with competitive golfers in mind. 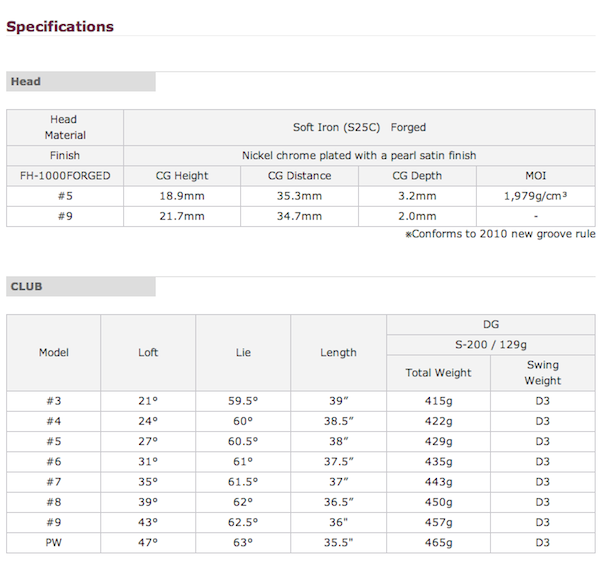 The heads are forged from a soft steel material (S25C) and are delivered standard with Dynamic Golf S300 shafts. 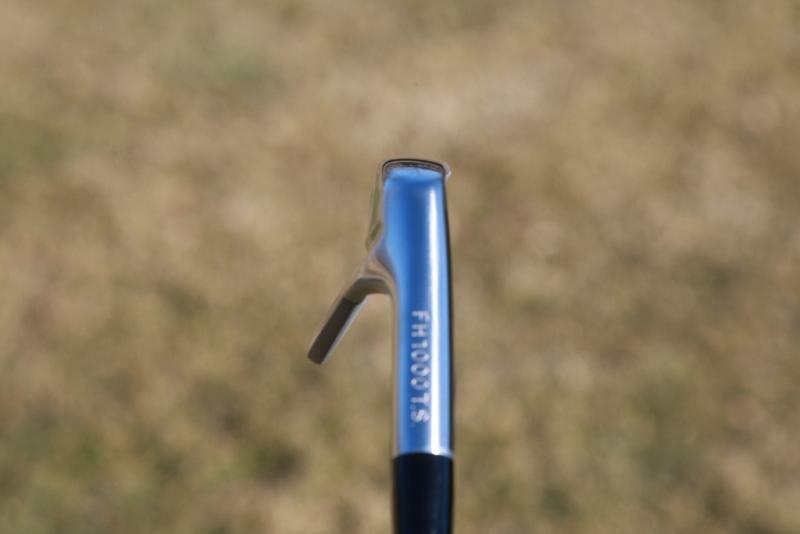 Above: The FH-1000 irons have Fourteen’s “reverse muscle back” design, which increases the weight of the upper blade portion of the head to add stability at impact. 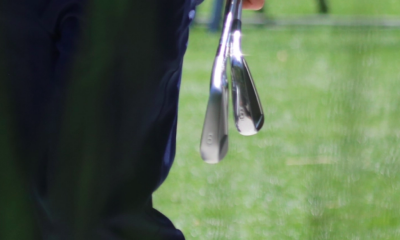 The main aspect that makes any club in the Fourteen family stand out from the competition is their attention to center of gravity (CG) lengths. 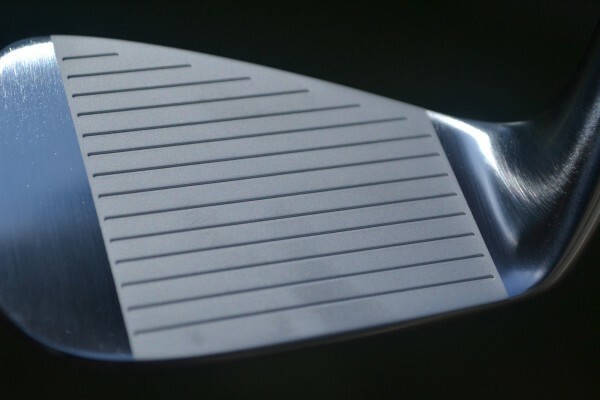 In speaking with Fourteen COO Marcy Kamoda, I learned that the main objective in each club design is the flow of the set from driver through the wedge. In simple terms, the center of gravity lengths should remain at 2 millimeter variances from club to club. What the better golfer would experience in this case is the ability to make a consistent pass at the ball from driver to lob wedge and find the sweet spot of the club. Fourteen is one of the few companies that focuses each club design on this idea. 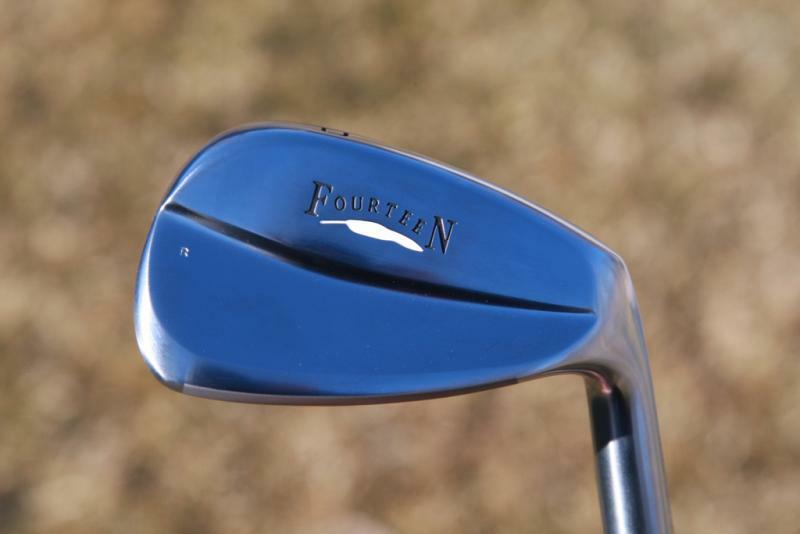 Click here to read our review of Fourteen’s RM-11 and RM-12 wedges. Fourteen’s FH-1000 irons are available through golf retailers such as Golfsmith, Fairway Golf and other stores (click here to find a Fourteen retailer in your area). In player testing, I found that these irons were indeed a bit more forgiving on off-center hits than other blades I’ve hit. The FH-1000’s provide a consistent feel from 3 iron through pitching wedge, which could be attributed to the CG length consistencies. 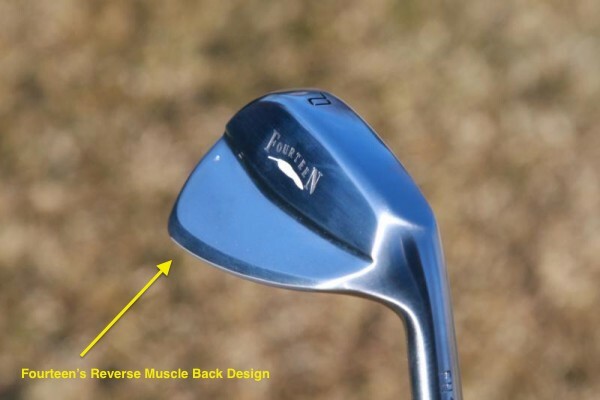 The “reverse muscle back” design, which moves weight to the top of the irons, offers more stability through the hitting area as well as a bit more forgiveness on off-center strikes. In my experience with forged blades, it’s not so much the shot direction that lacks but the substantial loss of distance on off-center hits. That was not the experience with the FH-1000 irons. I would say that a slight mishit may cost a player a 3-to-5 percent distance loss with the FH-1000 irons, while other blades I’ve hit have cost me as much as a 10 percent distance loss on off-center hits. 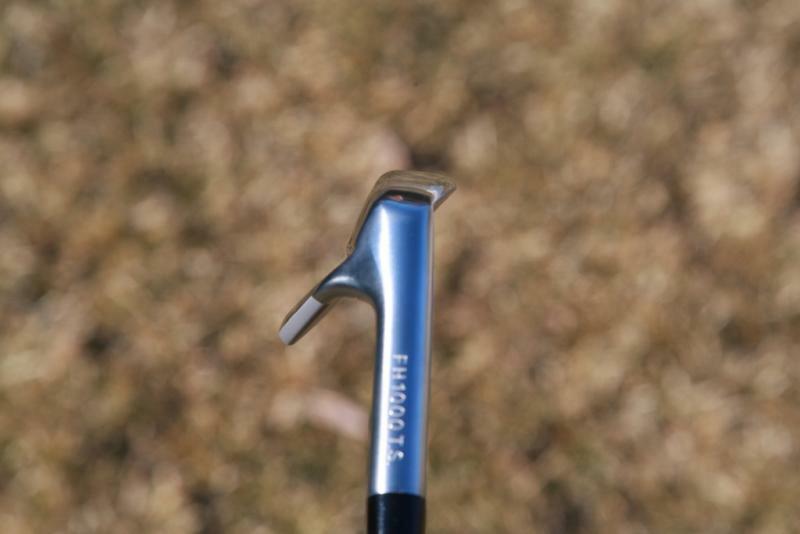 Like most blade-style irons, ball flight control was easily achieved. The long irons offered a higher launch thanks to their lower CG, while the higher CG of the short irons allowed me to hit lower, more penetrating shots. Where I was pleasantly surprised was the lack of discrepancy between long iron mishits and short iron mishits. In my experience, there has always been a large gap in the two. Long iron mishits had both direction and distance problems, while short iron misses were much easier to stomach as they only seemed to affect distance. 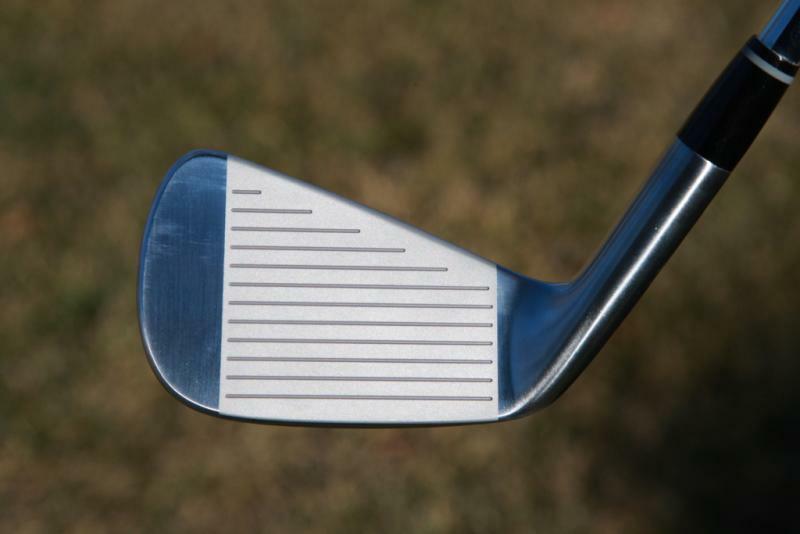 All the irons in the FH-1000 set seemed to suffer only distance losses on off-center hits, which proved to me the value of the company’s design philosophies. All my testing done on the course/range without the benefit of a launch monitor, so I can’t speak to spin numbers with any degree of accuracy. What I can say was in comparison to the the other blades I’ve used, the FH-1000 longer irons allowed me to get the ball in the air with less effort. Above: An FH-1000 7 iron at address. 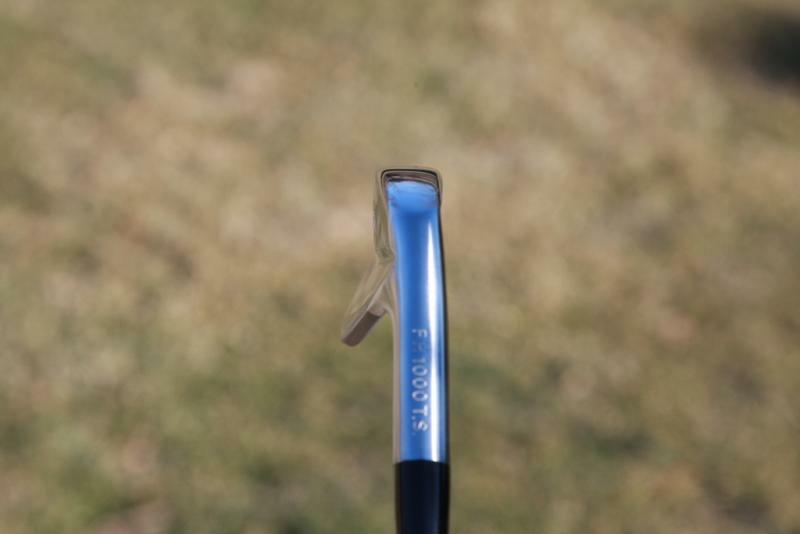 In regards to turf interaction, the FH-1000 irons have a pretty sharp leading edge that can help better players get a cleaner strike at the back of the ball, both from the fairway and the rough. It’s certainly not a sole grind designed for players with overly steep angles of attack, which makes sense for the blade iron audience. 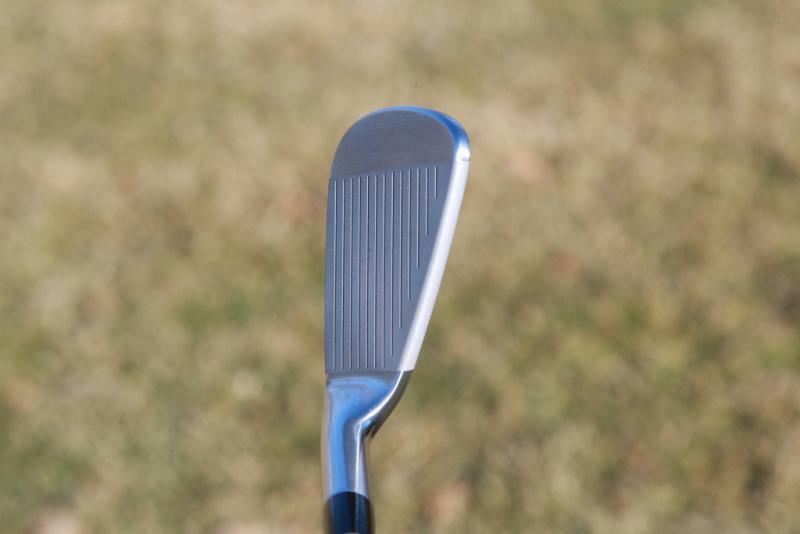 The sole, however, is slightly wider than most blades, which was likely a contributing factor to the forgiveness of the irons and my ability to hit the long irons higher. Another stand out feature of the FH-1000 was the distance control. 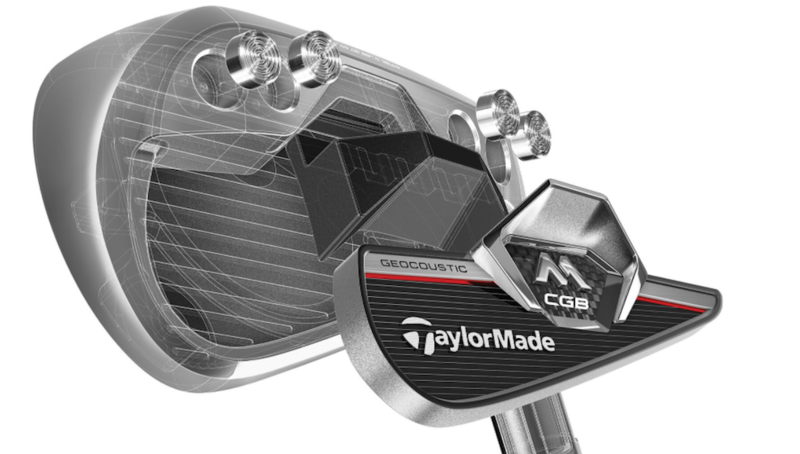 Like most muscle back irons, the technology lends itself to precision and not increased distance. 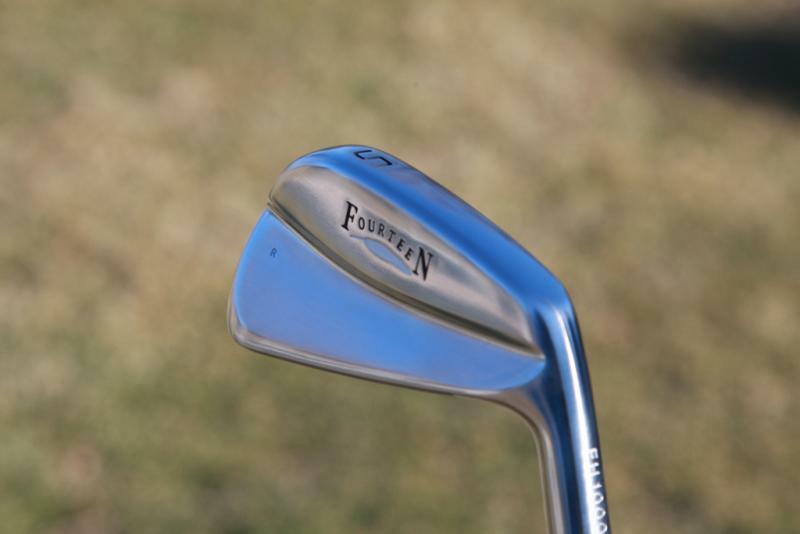 The standard loft of the clubs are fairly traditional, coming stock with a 21-degree 3 iron and a 47-degree wedge. That setup offered me plenty of shot-stopping power without ballooning problems. This is where Fourteen Golf separates itself from the competition before a shot is ever struck. 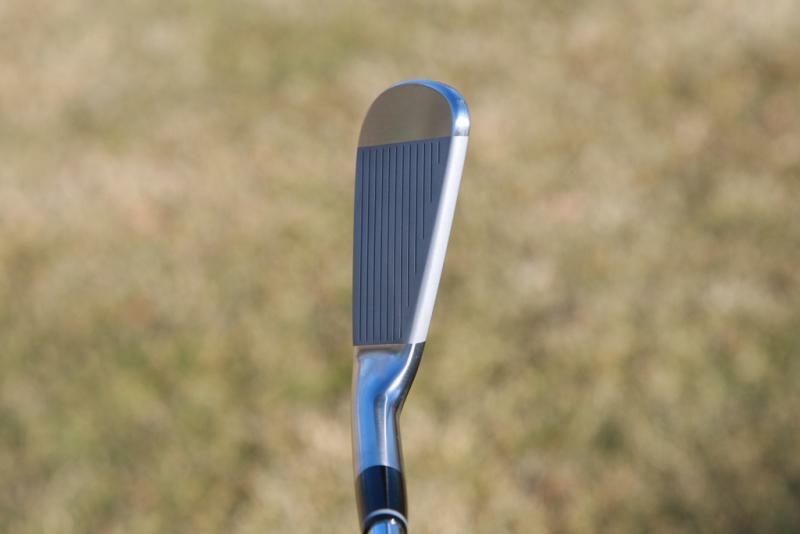 The FH-1000’s have has serious curb appeal, with thin top lines that flow into medium blade lengths that are reminiscent of Mizuno’s extremely popular MP-64 irons. 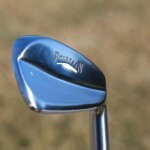 Like the MP-64’s, the irons aren’t small, but golfers won’t call them large either. 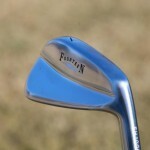 Click here to see comparison photos of the Fourteen FH-1000 to Nike’s Victory Red Forged Blade irons in our forum. The FH-1000 irons also make a statement in the bag thanks to their stunning brushed satin finish and their unique lines. 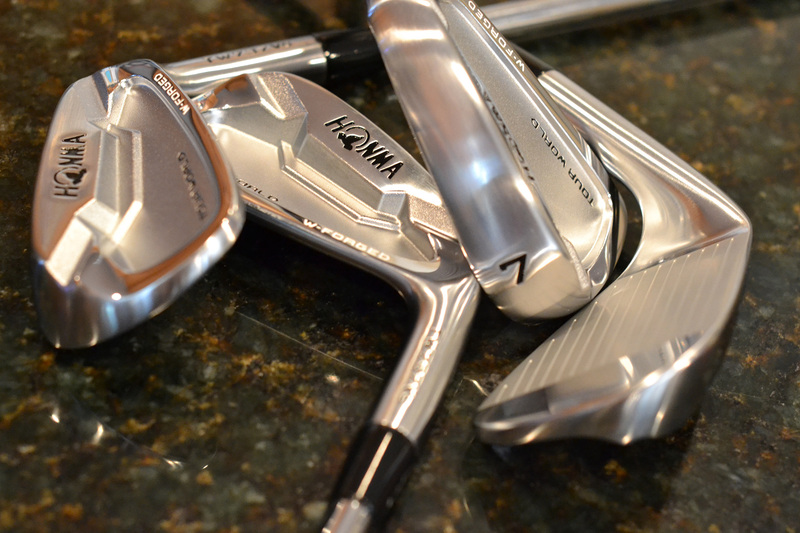 Serious gearheads know that there are irons with satin finishes, and then there are irons with great satin finishes. The FH-1000’s fall into the latter category, and have understated logos that emphasize the richness of the carefully applied finish. 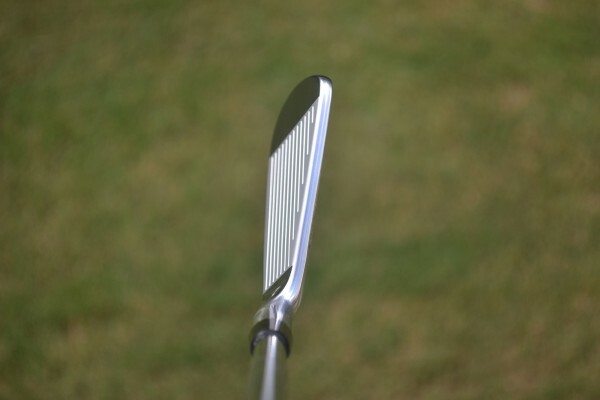 Each iron simply looks and feels like a work of art, and the reverse muscle back finish adds a touch of uniqueness to the irons that few muscle backs have. 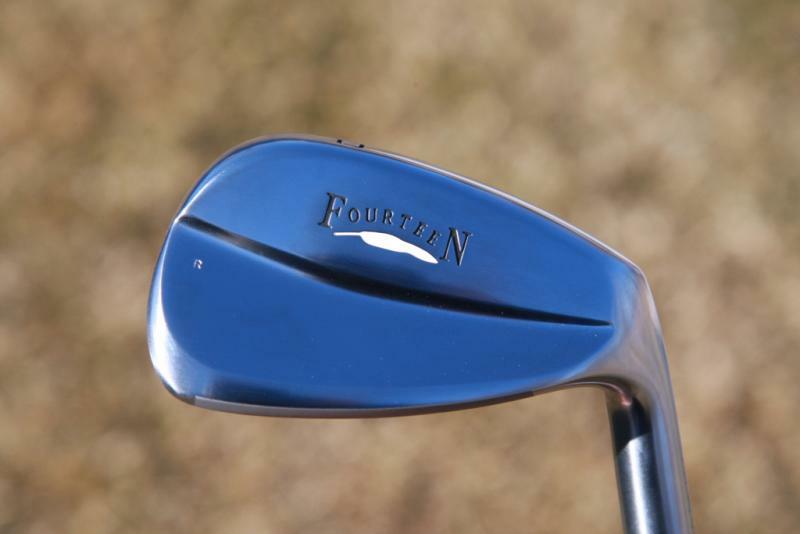 In terms of the overall feel, the FH-1000 are extremely soft with a turf interaction that harkens back to popular Japanese forgings from Miura, Mizuno and Maruman. In my study of what better players look for in a club, sound is always an important characteristic. The FH-1000’s are on the softer side, and I experienced a nice thud when I found the middle of the face. Due to the softness of the forgings the clubs will ding up over time, but that’s unavoidable in any soft forging. In today’s golf equipment market, manufacturers are raising the bar in terms of technology each year. 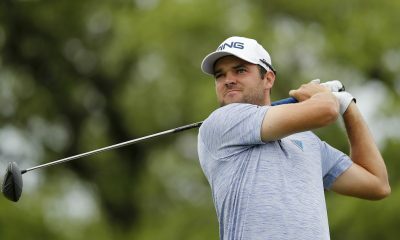 The competition is stiff for Fourteen, but the company has built a following with clubs that appeal to golfers seeking top-notch craftsmanship, as well as a blend of performance, good looks and a pleasing feel. 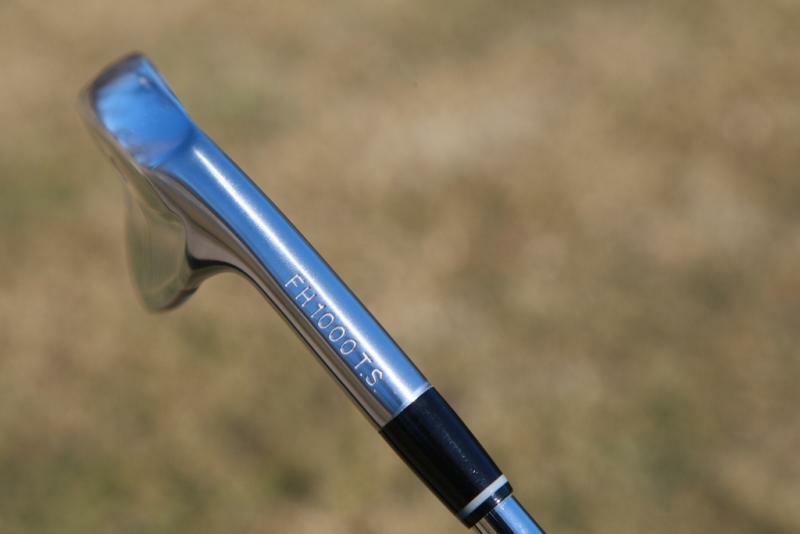 The FH-1000 irons are no exception. Johnny Wunder is the Director of Original Content, Instagram Manager and Host of “The Gear Dive” Podcast for GolfWRX.com. He was born in Seattle, Wash., and grew up playing at Rainier G&CC. John is also a partner with The Traveling Picture Show Company having most recently produced JOSIE with Game of Thrones star Sophie Turner. In 1997 Johnny had the rare opportunity of being a clubhouse attendant for the Anaheim Angels. He now resides in Toronto, On with his wife and two sons. Do these have conforming grooves? I own this set (5-PW) and they’re freaking like butter! My whole set is Fourteen and couldn’t be happier! These clubs are perfect for me, and people who can appreciate blades instead of cavity backed irons will love these irons. Zak,You are correct. I’m currently playing the TC930’s. My set of FH’s are due to land today, I can’t wait to take them to the course. 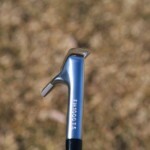 They will also be on display at the Seattle Golf Show this weekend if anybody is going to the Show. You are gonna love these things! PURINA!!!! Im from West Seattle, HELL YEAH HAWKS!!!!!!!!!!!! LOB! I’m not sure how these didn’t get 5 stars for look and feel….. I can’t believe more people don’t play blades. They are so pure and give you instant feedback. Nothing beats the feels. The fourteens are nice, but I prefer the miura mb-001. Pure745 plays them. Why was this not included in the review? Thought Todd Hamilton used a sonertec md in his open championship win. They have the club on display at the royal & ancient museum in St. Andrews . Unless fourteen forged the club for sonertec. You’re right, Ian. 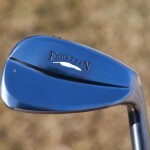 The article has been edited to reflect that Ernie Els used a Fourteen utility iron in route to his 2002 British Open victory. Pros: Incredible feel all the way through the bag. These irons offer considerable forgiveness on mishits, and their slightly stronger lofts generate plenty of distance for a better-player forged iron. Cons: Some will find the price point ($150 per club) too high to consider. 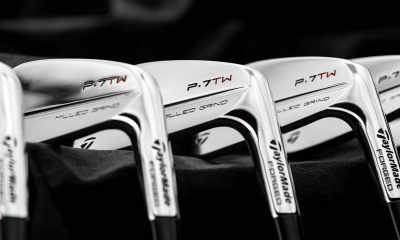 Bottom Line: The entire TW737 line boasts impressive specs and looks. 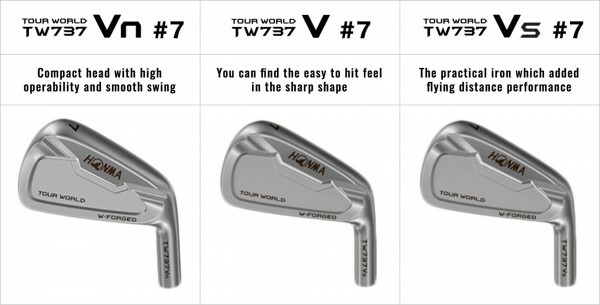 The TW737-Vs, with their slightly larger shape and stronger lofts, could be perfect for the player ready to move from game-improvement irons to better players irons or for those those looking for more forgiveness in a forged set. That is about to change. 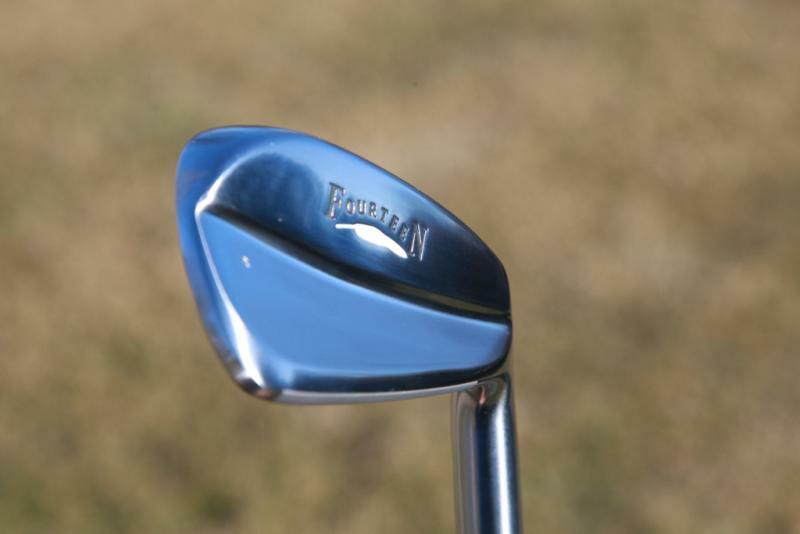 Honma, a mainstay in the Japanese Domestic Market for almost 60 years, is making a major push to become a household name in the U.S. and Europe. This year marks the company’s first entry into national “Hot List” competitions, and you can now find and test some of their products, such as the TW737 irons, in big-box golf stores like the PGA Superstore. 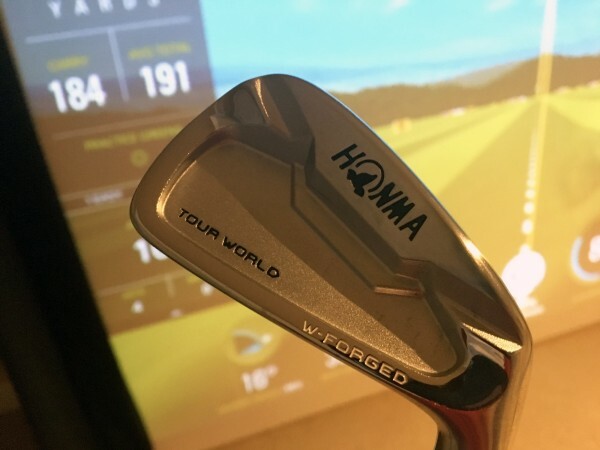 While Honma has traditionally been associated with extremely high-end clubs — even gold-plated at times — the Tour World line is priced similarly with other forged irons from domestic manufacturers. 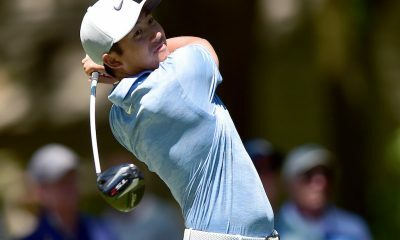 Tour World also happens to be the line played by their tour pros like Hideto Tanihara, who has the TW737-Vs in his bag. 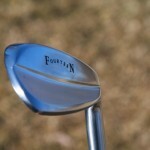 There are three unique models in the Tour World 737 line, each with slight variations in loft and head shape that are designed to fit the specific needs of forged-iron users. 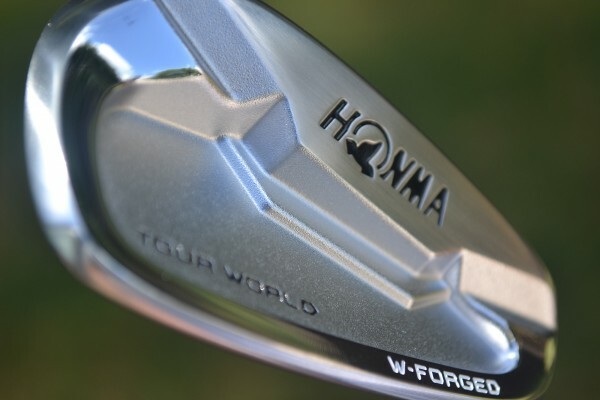 Each model includes Honma’s unified face progression and center of gravity design, which essentially allows for slight changes in sole width, face thickness, and head size based on loft, while keeping the same offset. The design is great in and of itself, and it also makes it easier to play a Tour World combo set. 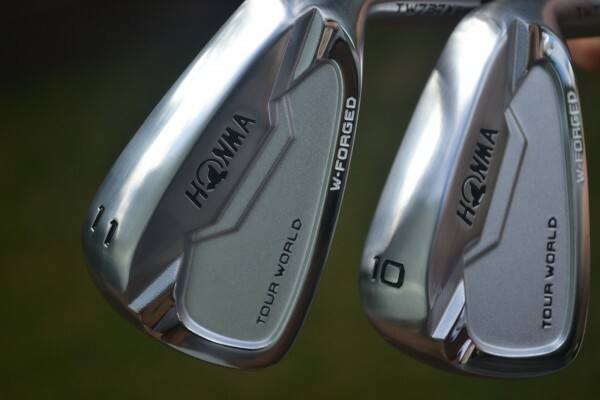 The entire TW737 iron line is forged from S25C steel using Honma’s proprietary high strength W-Forging, a two-stage forging process that mixes hot and cold forging. 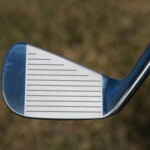 According to the company, the process creates more density in the club face, especially high on the face. The extra strength is said to increase ball speed and forgiveness. The TW737-Vn is made particularly for better golfers who like the shape and workability of a blade, but want a little more forgiveness. 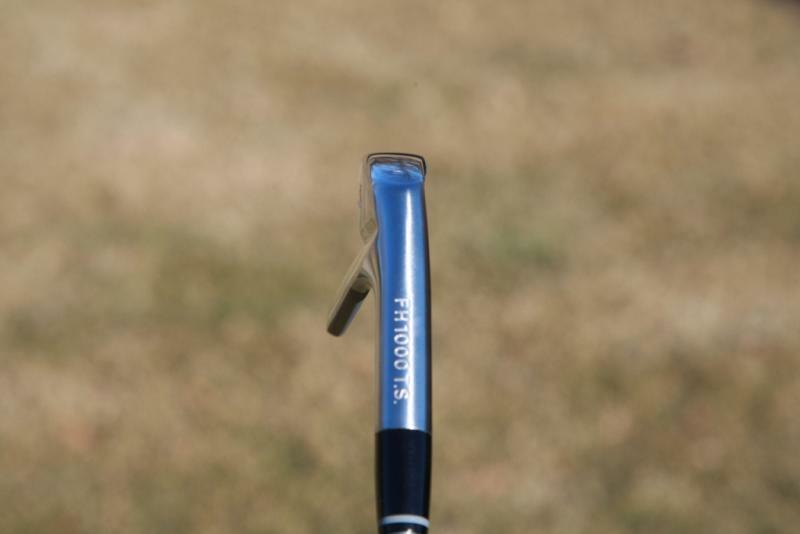 The TW737-V has a small cavity-back head, but adds a little more forgiveness and distance than the Vn. The TW737-Vs, the model I tested, has a slightly larger head and strongest lofts, making it the longest and most forgiving of the three forged irons in the TW737 lineup. 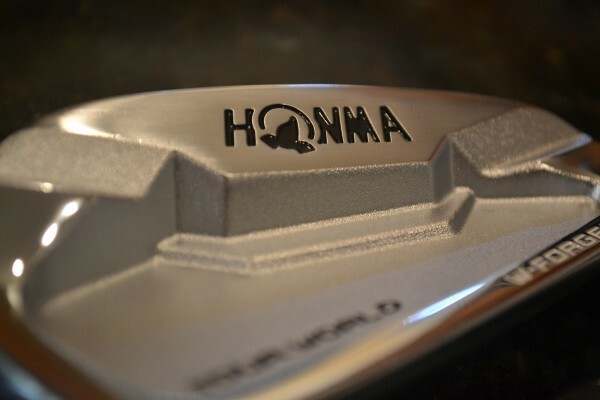 You can find all the specs on the Honma site here. The TW737-Vs specs are below. 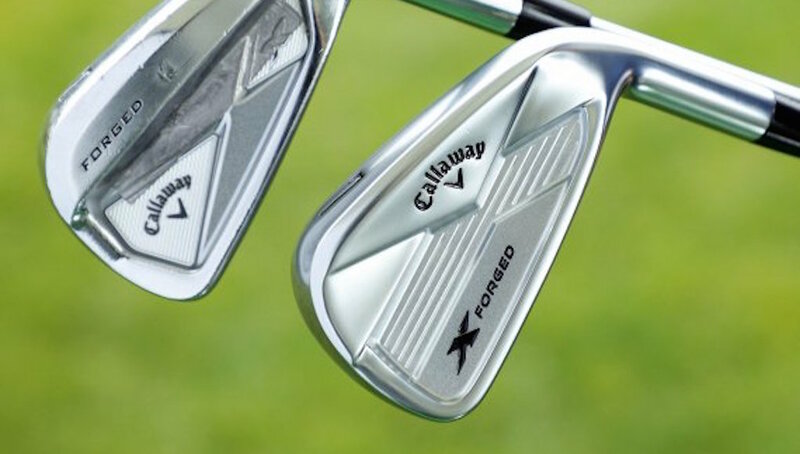 TW737-Vs irons are available now in 3-11 ($150 per club). A variety of stock shafts are available and include the NS Pro 950GH, Dynamic Gold AMT, Modus3 Tour, and Vizard 160. Honma has a retailer search on its site to help you find nearby golf stores where you can check out these clubs for yourself. Of course, custom shaft and grip options are available. 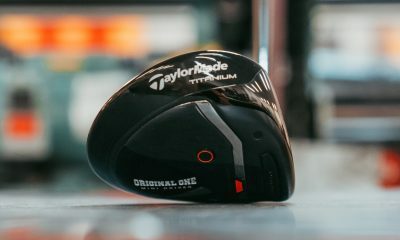 I decided on the TW737-Vs because I wanted the extra performance and forgiveness. Honma built a 3-11 iron set, standard length, 0.5-degrees upright with Golf Pride New Decade Multi-Compound grips and two wraps of tape. Having played cast, game-improvement irons my entire golfing life, I was anxious to see how these clubs would look at address, feel at impact and most importantly, how they would perform for my swing. 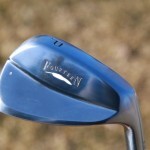 In recent years, I have been using a forged Vega wedge, also an iconic Japanese brand. I love the feel, so I was excited for these. You might be wondering, “Why test against a cast club and not compare Honma to Honma or Honma to Miura?” One reason is that like many of you, I’m precisely who Honma is looking to attract — a US-based consumer who has been playing mostly domestic clubs. After testing I can tell you the irons are not too small, not too hard to hit, and stack up to anything else I’ve tested. I like to start testing outside before getting on a launch monitor so I can focus purely on what I’m seeing and feeling. And with these clubs, my expectations were high, very high. I started with the 11-iron because… how often do you get to hit a club stamped with an 11? I’ve always taken a significant divot with my wedges, but my first swing resulted in a solid, crisp shot with a thinner divot. Everything about the shot felt perfect. This happened to be a center strike and impact felt like almost nothing at all… in a good way. The sound was solid and strong, but the first real feeing I registered was slicing through the turf. That feeling continued even with the long irons. Hitting a 3 or 4-iron around the middle provided plenty of feedback, but the more pure the strike, the less feeling there was. The ball flight appeared to be slightly lower than my current set, with a straight-to-draw flight and similar distances. Working the ball both ways was not a problem. On the course, I struggled with distance control at first. This was my own fault for not dialing in the distances, especially with the stronger lofts in the 7-iron and shorter clubs. My expectation was that these clubs would not fly as far as my current clubs, but I couldn’t have been more wrong. The exceptional feel continued. Truly effortless power on center strikes. The ball just jumped off the face and provided plenty of feedback and forgiveness. My divots from fairway lies were thinner than normal, which I don’t mind at all. These clubs cut through the rough nicely as well. My favorite moment came at an island-green par-3, No. 16 at BridgeMill Athletic Club. 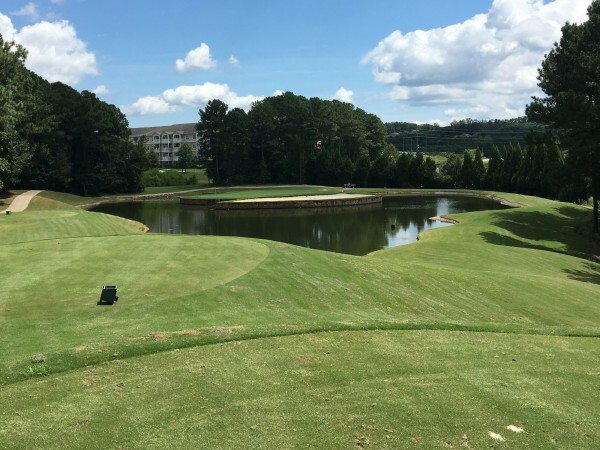 I had 160 yards to the pin, with 150 yards covering the water and 175 yards to the water at the back of the green. 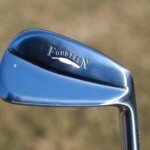 With my old set, it would have been a smooth 8-iron (a full 9-iron is a reliable 145 yard carry). For me, the TW737-Vs 9-iron is essentially an 8.5-iron, so I went with 9-iron and played to the center with a little draw. I hit one of the most solid shots of the day, and it landed just a few feet away from the pin. Trusting a 9-iron would be enough… now that was fun. My expectation going into launch monitor testing was that I’d see a flatter trajectory, lower peak height, similar distance and spin, and a decent amount of help on mishits. I tested the TW737-Vs on SkyTrak against my TaylorMade RSi 2’s using Bridgestone Tour B330 balls. I rotated clubs every 5 shots and went through multiple rounds with each club. The launch monitor data backed up what I was seeing on the course. For the short and mid irons, the Honmas generated slightly more distance (not less as I expected prior to testing). 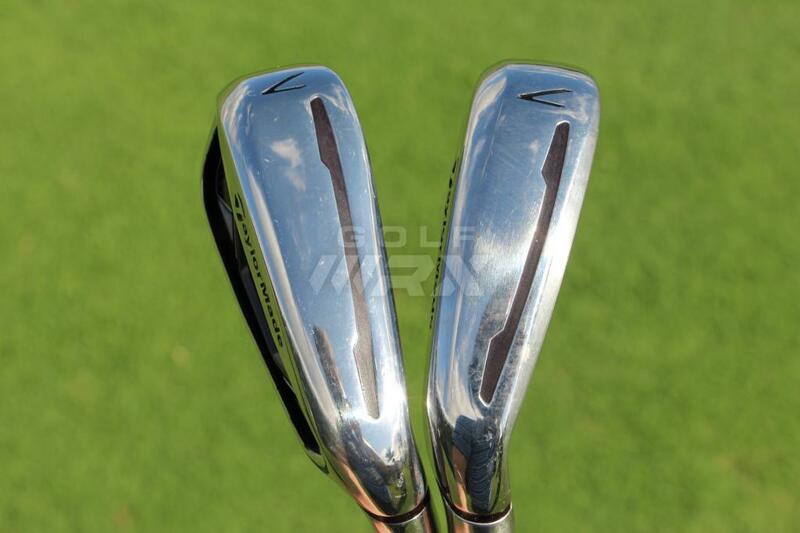 The 9-iron had the biggest gap, but the TW737-Vs is also 2 degrees stronger. Spin was lower, but I was also seeing slightly more draw bias to my shots. While the spin looks a little low, on the course I had no issues stopping the ball on approach shots. 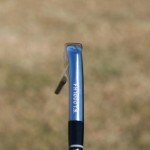 With the long irons, my flatter trajectory always forces me to play for a little roll, so that won’t change. I’ve never been a high ball hitter. My swing produces a lower flight and I’m sticking with it. Not surprisingly, my launch angle and peak height with the TW737-Vs was slightly lower across the board. Ball speed on heel and toe side of center dropped about 2 mph on average, but the shots were very playable. 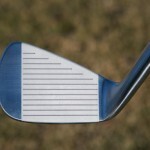 With the 3 and 4-irons, toe shots generated quite a bit more left spin, but heel shots didn’t really impact the flight. For shots higher on the face, I was very surprised and happy to see a minimal loss of distance. All in all, these clubs are very playable and forgiving on shots that miss the dead center of the clubface. Feel is subjective, but I love the way these clubs feel. There is a nice weight through the swing. 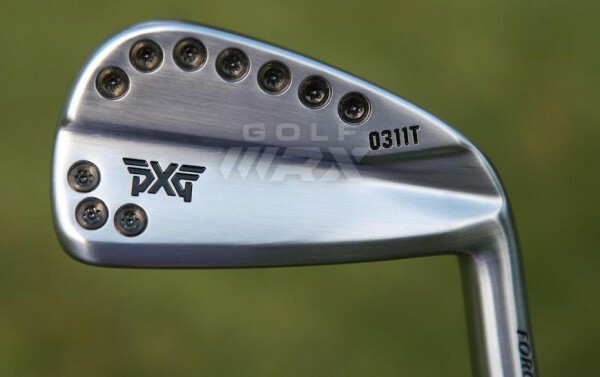 The W-Forging process has created a strong face that fires balls off like little rockets. 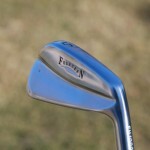 Some other irons have a spring-like feel at impact, but with these, center shots just seemed to melt into my hands. I spent a lot of time using powder spray on the face to see the exact impact location. With other irons I’ve tested, it is easy to know if I hit the extreme toe or heel side. 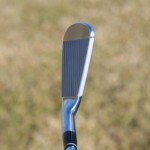 But with the TW737-Vs, I was able to feel if I was half a ball to the heel or toe side. Same with being low on the face or a few grooves high. Both better players and mid-handicap golfers looking to improve will appreciate the feedback these clubs provide. As for looks, “These are beautifully simple” was my first thought when I saw them in person. The lines are clean and sharp in some areas and smooth and rounded in others. The head, while definitely smaller than what I’m used to, doesn’t feel or look too small. I don’t have any confidence issues looking down at the ball. Each of the TW737 models have the same minimal amount of offset, creating a relatively straight edge from the shaft out to the toe. I find it easier to set up and align clubs with less offset, so I like this a lot. I wouldn’t call the top line thin, but it isn’t thick either. Overall, I just really like how these irons look at address. The mass low and right in the middle of the face conveys a sense of power, and the designers left plenty of material on the toe and heel to help minimize mishits. The half-mirror finish on the face and top line cuts down the glare at address. 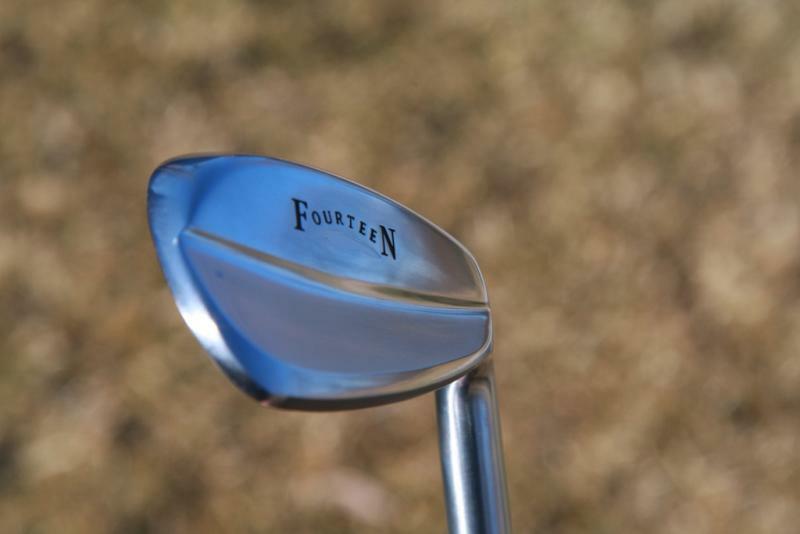 I would rather see the half-mirror finish replace the rough finish on the back — it’s just a personal preference — but the third texture does provide another dimension to the look of the club. 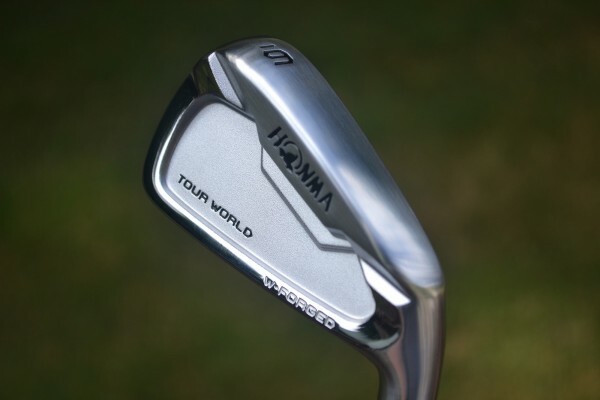 Honma might not be the first name most Americans think of when they think of forged irons. 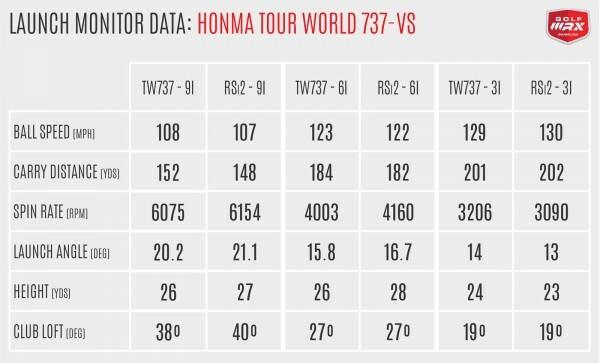 That is going to change… not just because Honma will be spending more money to reach golfers in North America, but because the company’s Tour World line is both beautifully crafted and packed with performance. 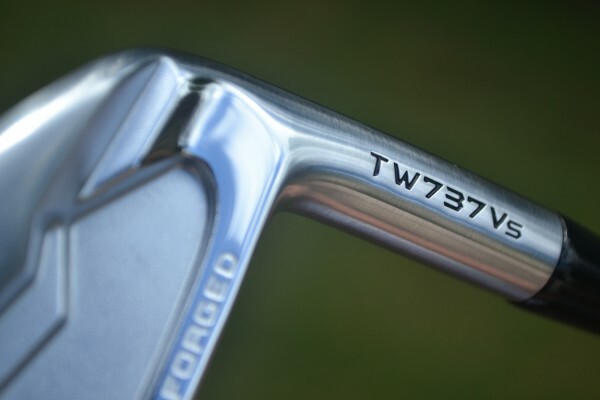 If you’re in the market for forged players irons, make sure the TW737 is on the list of clubs to hit. One of the many benefits of being a GolfWRX Forum Member is exclusive access to Giveaways and Testing Threads. For Giveaways — we give away everything from golf clubs to golf balls to GPS units — all it takes is a forum name. Enter any Giveaway, and we select winners randomly. You’re then free to enjoy your prize as you wish. For Testing Threads, the process a bit more involved. GolfWRX Forum Members sign up to test the latest and greatest products in golf, and then they provide in-depth reviews on the equipment. Being the intelligent golf-equipment users they are, GoflWRX Members are able to provide the most-informed and unbiased reviews on the Internet. In this Testing Thread, we selected 75 members to test a TaylorMade M1 2017 7-iron and TaylorMade M2 7-iron. Each of the clubs were built with the stock lofts and shafts — M2 2017 (28.5 degrees) with a TaylorMade Reax shaft, and M1 2017 (30.5 degrees) with a True Temper Dynamic Gold S300 shaft — and the testers were instructed to post their review of the clubs here. Below, we’ve selected what we’ve deemed the most in-depth and educated reviews out of the 75 testers. We have edited each of the posts for brevity, clarity and grammar. Thanks to all of those involved in the testing! 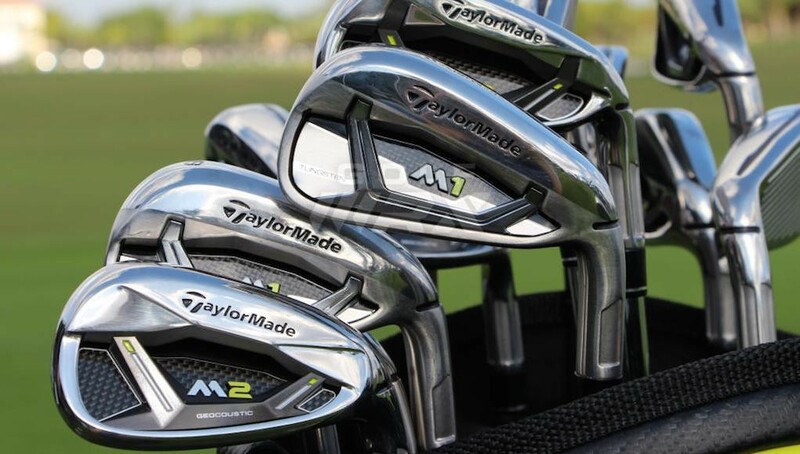 To be honest, looking down on the TaylorMade M1 and M2 irons at address, there is really not much difference. I would have to pick one up to see which is which. The first 10 balls I hit were with M1 and 6/10 felt great, while the other 4 were toe hits, which I felt and the distance reflected that. 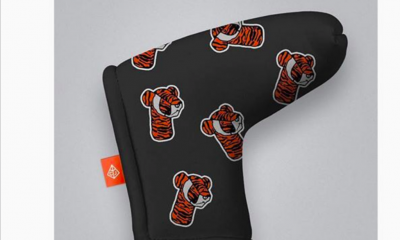 Kinda what I expected with a club design for lower-handicap players. Distance was about 1/2 longer than my Srixon iron and dispersion was close, as well. 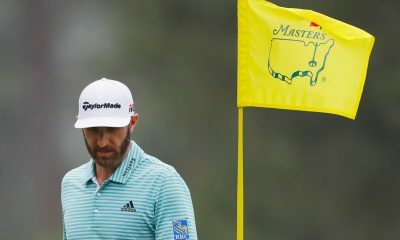 I will say they did not feel as good as the Srixon on center hits. Next 10 (ok, 15) balls were with the M2. Wow, can you say “up, up and away? The ball really popped of the club face, but wasn’t a ballon flight. Waited for the ball to come down and WTH, with the roll out it was 5-8 yards longer than balls hit with M1, and that is with a few toe shots. I did some smooth swings and then very aggressive swings and was a little amazed at this iron. Just like the M1, it does not have the forged feeling and does have a clicky sound (which I hate). Bottom line: M2 is the longest iron I have ever hit. I love my 545s, but I could see myself playing M2 very easily. Matter of fact, I will be taking this M2 7 iron in my bag and play it more head-to-head against my Srixon 545 on the course. These are both beautiful clubs. What surprised me the most is how much alike the two clubs look at address. I was expecting a chunky topline and significant offset in the M2, but it’s footprint looked almost exactly the same as the M1, outside of the chrome finish on the M2 versus the frosted finish of the M1. 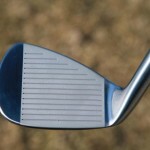 The M2 could almost pass as a player’s iron to my eye at address. These clubs both get A’s from me in the looks department. The M1 felt a tad thicker than most player’s irons I’m used to, but it seemed to come with a bit of added forgiveness too. Well-struck shots felt good, with a nice mid-trajectory and with the workability that I’ve come to expect from a player’s iron. 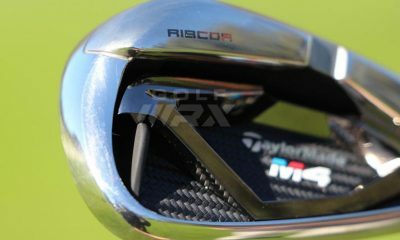 But true to TaylorMade’s claims, the M1 seemed more forgiving than a traditional player’s iron. Had a nice soft feel at impact, mishits didn’t sting and left you with a more playable result. 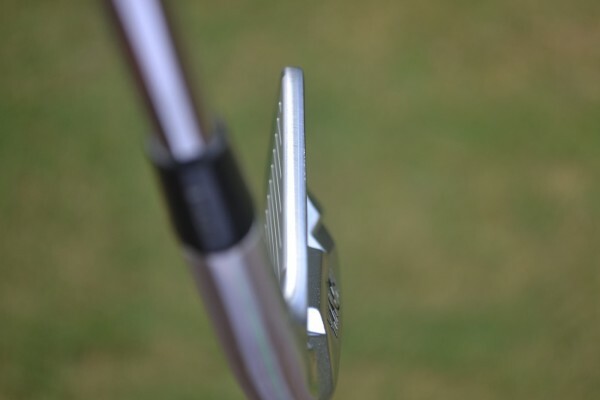 A really nice combination of the better attributes of both player’s and game improvement irons. I’ve been playing with an old set of Tommy Armour blades, but I’ve been recently wanting more forgiveness for when I’m stuck with my B or C swing. Based on the early returns, I could definitely see myself bagging these. I’m not sure if it’s the shaft, the design of the clubhead, or a combination of both, but the M2 is definitely a different animal than the M1 at impact. 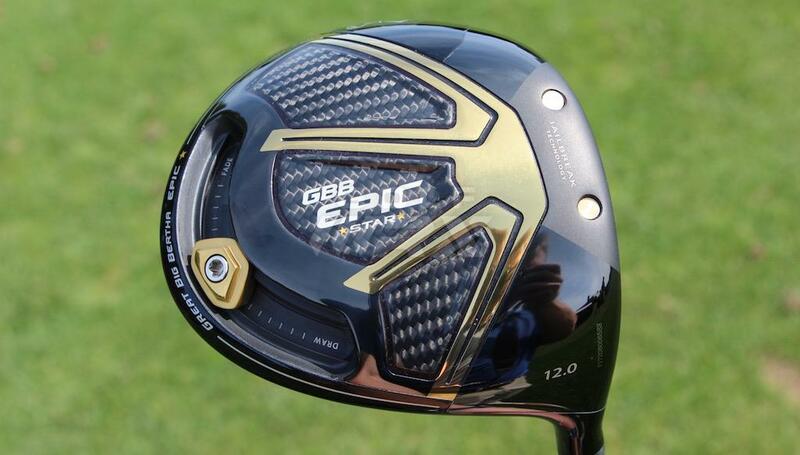 This club launches the ball high, arguably ridiculously so. I was hitting Jason Day moonbombs with this bad boy. Didn’t seem to matter what kind of swing I put on it, the ball launched high, flat and dead straight. The club was super forgiving and if not for the insanely high ball flight, I would love to have a set of these for when my swing is out of sorts. I didn’t really try to flight it at all, so I’m not sure what it’s capable of at this point. One other note was that the M2 had a clicky feel at impact. It didn’t bother me since it still felt so sweet… so strange as it sounds, clicky, but smooth and sweet at the same time. 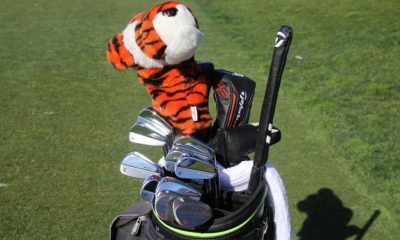 I think these clubs will be big winners with the mid-to-high handicap set. 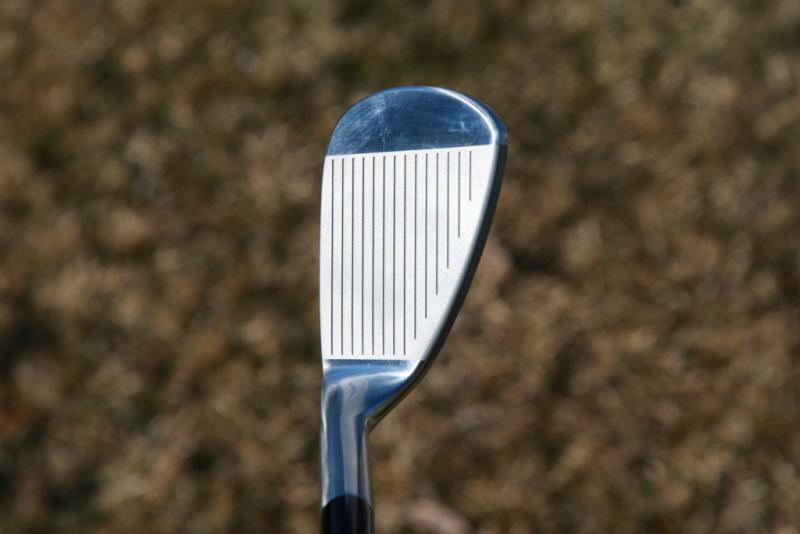 The M1 is a fine iron, but doesn’t really stand out in any way from other irons of its class. The M2, on the other hand, is an iron on steroids. I’m really starting to love this thing. It’s super forgiving and just goes and goes. According to my laser, flush shots were going 195 yards (my usual blade 5 iron distance) and very high. I can’t help but think golf would be a whole lot easier, particularly longer courses with long par 3s, with a full set of these in my bag. M1 feels softer than the M2 and I felt the ball flight was more consistent and what I want in an iron. The M1 did have a harsher feeling in my hands than I typically like, but I’m going to credit a lot of that to the range balls. M2 flies very high. It was a windy afternoon and about 100 degrees. I love the high ball flight on the range, but I have a concern what that ball flight would be like on the course. I like to hit the ball different heights for different shots and I don’t think I could do that confidently with the M2, but I could with the M1. I don’t like the sound of the M2. It sounded “clicky” to me. P.S. LOVE the Lamkin UTX grip! Now, this was interesting, the M2 was quieter then the M1… weird! Now, there is more carbon fiber added to this one and there is a “Geocoustic” label on the back. I am sure that it has something to do with all that carbon fiber but it does have a better sound. Other than the sound, it played exactly like the M1: long and straight. The REAX shaft felt a little weaker than the True Temper shaft and it flew a little higher but nothing else I could pick up. Finally got out to the range after getting these bad boys in on Friday. My first impression of them is that they look really sharp. 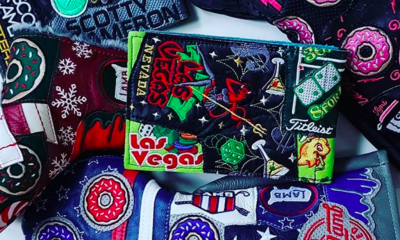 The graphics and design really stand out and really give these clubs a cool, modern look. They were both a little to big IMO, as I am currently bagging Mizuno MP-68s. The M2 isa definite “game improvement iron”, while the M1 was similar in size and shape to my previous irons, Titleist AP1s. They both really launch it, high and far. Ridiculous for 7 irons. I don’t have access to a launch monitor, but it was about a 20-yard difference between my gamer 7 iron and these (stronger lofts, as well). The M1 definitely was more suited for my eye, and produced more consistent ball flights. It felt much more smooth and solid as the M2 had a clicky, cheap feel. The M2 just isn’t for me. I felt like it was launching too high and ballooning, which could be due to the shaft (the M1 had the S300, while the M2 just had a stock “Reax” shaft). The feel off the face of the M2 just turned me off, to be honest. While I don’t think I’ll be putting either model in play, I can definitely see the appeal for mid-to-high handicaps. Both irons were super forgiving, and they should be a dream to the average weekend golfer who has trouble with ball striking consistently. Looks: As expected, I preferred the M1 with less offset, slightly smaller sole and a smoother finish. Less glare looking down on the iron. I must say the M2 did not look as bulky, or have as much offset as I thought it might have. Feel: This was a close race, probably due to the shafts as much as the heads. The M1 was just a slight bit smoother feeling on solid shots. But the M2 was not bad at all, just not quite as smooth. 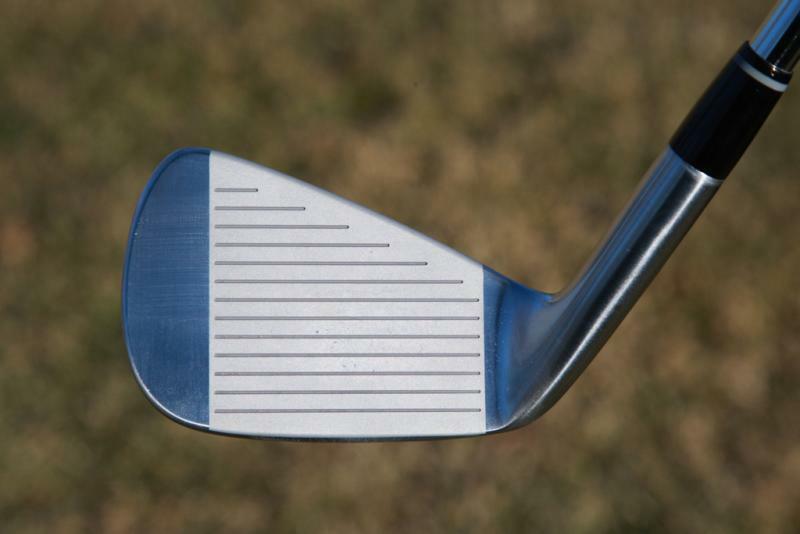 Distance and performance: Our range has a slight incline up the length of the range, so specific yardage gains or losses were difficult to measure. Both irons had a higher trajectory than my gamer 7 iron. Neither sole dug onto the turf either. The lofts for both irons are a degree or two stronger than mine, so I would think they probably flew a little further than my gamers. Neither iron flew “too” high, however. Might be a little harder to hit knock down shots, though. Final thoughts: I had hit both the M1 and M2 irons last year during a fitting day, but did not like either. This year’s model were both better in my eyes. I asked a fellow member at our club to hit both and he felt the M1 was his preferred model, and he is a 20-index player. So coming from both a single digit, and a high double-digit, the M1 won this battle of wills. I will try and see if I can locate both a 5 iron and 9 iron to see if a full set might be a winner for me. I was surprised that the M2 was the winner in this brief session. It felt better, flew higher, easier to hit and about 1/2 club longer that my gamer Apex CF16. The feel/sound was better than I thought it might be, but really not up to the CF16. I could, however, easily game the M2’s. Feel: I hit the M2 first, and found it to be very solid when hit on the screws. There was almost no feel off the club face at all. When I mishit it, you knew it was, but it wasn’t harsh at all. Hit the M1 next, and same type of feel when hit solid. Much more harsh when mishit though, but I knew that was coming. Distance and performance: This is was where I was curious to see how they would play. The M2 went out high in the air, and just kept going forever. Now granted my eyesight isn’t that great anymore, but it looked like I got about 10-15 yards more from the M2 compared to my Wilson D300. The only thing I didn’t like about the M2 was how much I was able to turn it over. Got a lot more hook compared to my D300. Don’t know if that was from the REAX shaft, but would love to find a less spinning shaft to correct that. The M1 wasn’t a great performer for me. Same height as the M2, but much straighter off the club face. Didn’t get any great distance advantage as compared to my D300. Can’t game a player’s iron anymore, and testing this one just reaffirmed that. Final thoughts: Was very happy with the distance I gained with the M2 compared to my current gamer. Very good-performing iron for me, and something I would definitely consider changing them out if I could reduce the spin off the face. If you’re looking for more distance, you need to try these out. 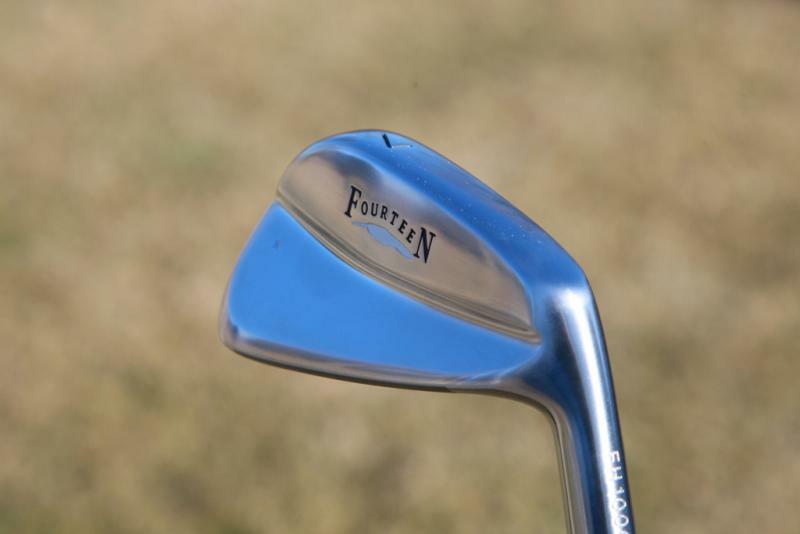 The M1 just wasn’t for me, but as a player’s iron, I can see it as a great option. Like the other testers, I found the M2 to launch the ball much higher and is 10-to-15 yards longer than my Adams XTD forged 7 iron. Of the two 7 irons I prefer the M1. I like the design of the M1 and its visual appearance at address. I feel more confident in trying to work the ball with the M1. 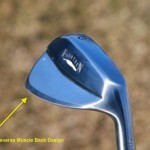 The M1 gave me more feedback as to where the club head was in relation to my swing plane. If I had my druthers I would put the M1 in the bag as it stands now. Will continue to test, what a treat to compare the two irons. Once I started making solid contact with a decent shoulder turn, the M2 really came alive in my hands. Towering flat height, for me, and very long. No more clacky hollow feel, just a very mild pleasant sensation… then zoom. Once I started making better swings, back to the M1, which was a very nice iron. Shorter than the M2 (though not short) and a little lower ball flight. Felt nice and substantial without being heavy. Very forgiving on slight mishits. But the M2 was the star for me. High trajectory and very long. Club felt lively and fun. Frankly, unless a player wanted a lower trajectory, or likes to hit a lot of knock downs or feel shots, I don’t know why anyone wouldn’t choose the M2. They are very attractive and a very fun iron. I think folks who say that the M2 feels and/or sounds clicky, clacky or hollow may be mishitting the iron toward the toe. I am not judging — I mishit a lot of shots at first. I agree on toe mishits the iron did not feel great. It almost felt like plastic. The ball still flew pretty well, but it wasn’t a very enjoyable experience. Not painful, just felt very dead. But when hit nearer the center, the iron felt fantastic. Light, springy and very lively. They are both good-looking clubs. Not too long heel to toe and toplines were not that distracting. M1 is more what I like to see shape wise, but M2 was not bad at all. Personally, not a fan of seeing the face slots. But I could see how some people may like how they frame the ball. 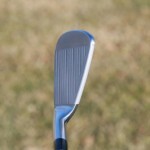 Visual first impressions: The M1 7-iron is visually appealing to me as far as the finish and overall look. Even though it is classified as a player’s iron, it doesn’t seem so tiny that it would be tough to hit. I am not a huge fan of the bright-yellow badging, but I probably could get over it. The iron inspires confidence with its topline and a little bit of offset. 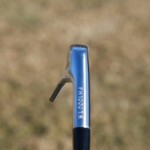 The “rubber” piece on the hosel is a little bit funky to me. I thought the M2 7-iron would look clunkier than it really is. Besides the finish being a little bit different, the difference between the M1 and M2 is actually pretty small. The M2’s topline and sole are a touch wider, but not by much. Not a huge fan of the fluted hosel since it can be seen at address. 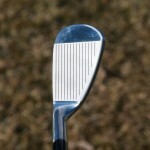 The M1’s fluting is only on the rear of the club. I did notice that the sole’s finish did scratch pretty easily. Overall, I thought the M1 and M2 are pretty good looking, but I would definitely give the edge to the M1. 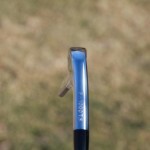 I also preferred the stock Lamkin grip on the M1 vs. the ribbed M2 grip. 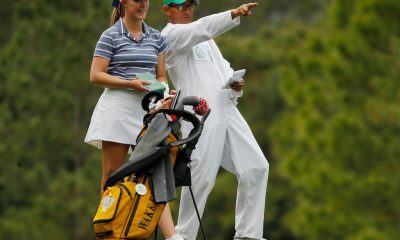 On course action: They both feel solid. 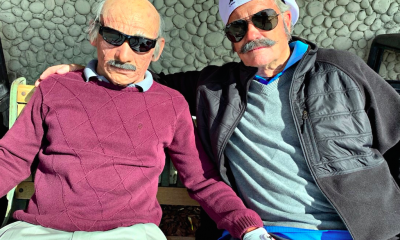 I tried hitting both irons in all different types of on-course situations over a two week period. Both clubs launch the ball high but I would not say they balloon. For me, the M2 was about 10 yards longer and higher than the M1. Compared to my Cleveland irons, they are 1 to 1.5 clubs longer. I know this accounts for the distance gain but the ball definitely comes off hot compared to my set. I was hoping I would hit the M1 better since I like the appearance better, but that was not the case. The M2 definitely felt better for me and I felt more confident with it in my hands. 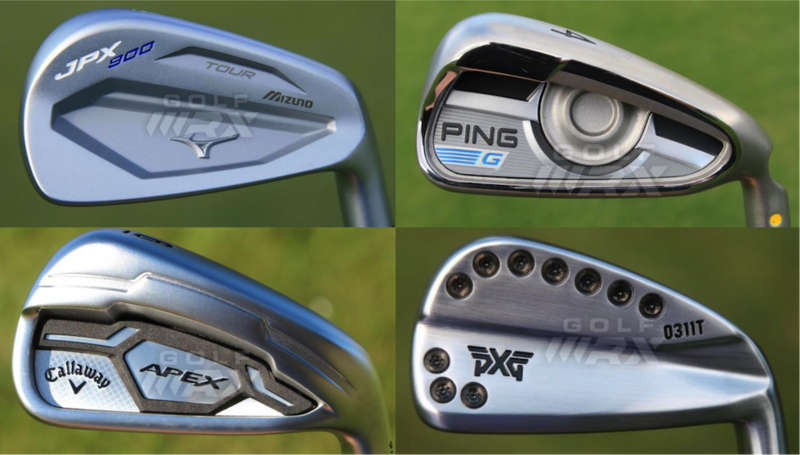 To help golfers find the best irons for them in 2017, we enlisted the services of GolfWRX Members, the most knowledgeable golfers on the internet. They not only understand the technology used in the latest golf equipment, but they also test new clubs extensively. Following their detailed experiences and words of wisdom about the latest products is the perfect starting point for anyone interested in purchasing new golf clubs. Players Irons: Basically, small-sized irons. 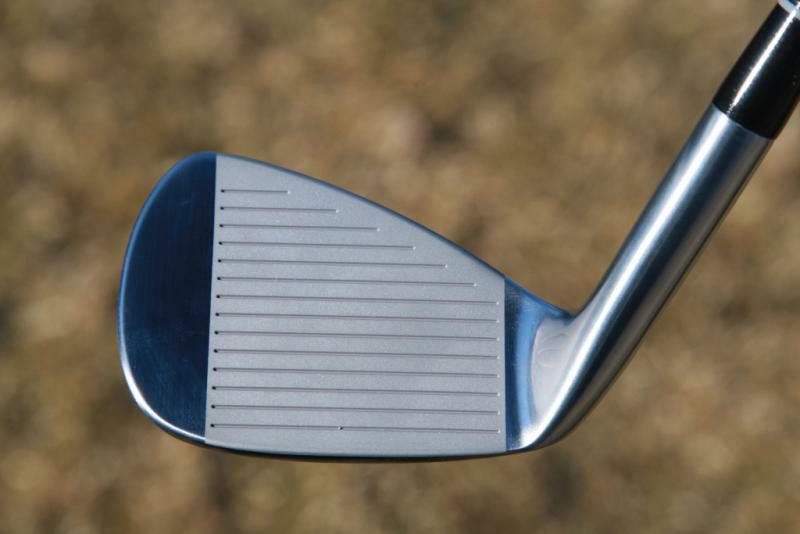 These irons have sleek top lines and soles. 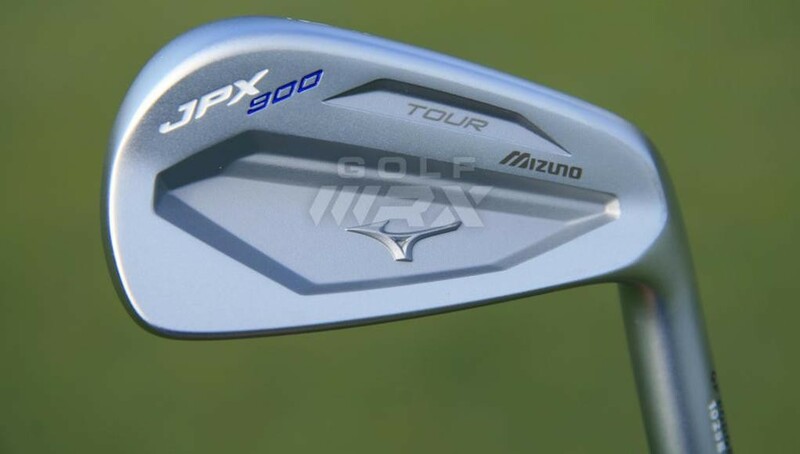 They place workability and control over distance, and for that reason they’re irons you can expect to see in the bag of a professional golfer. 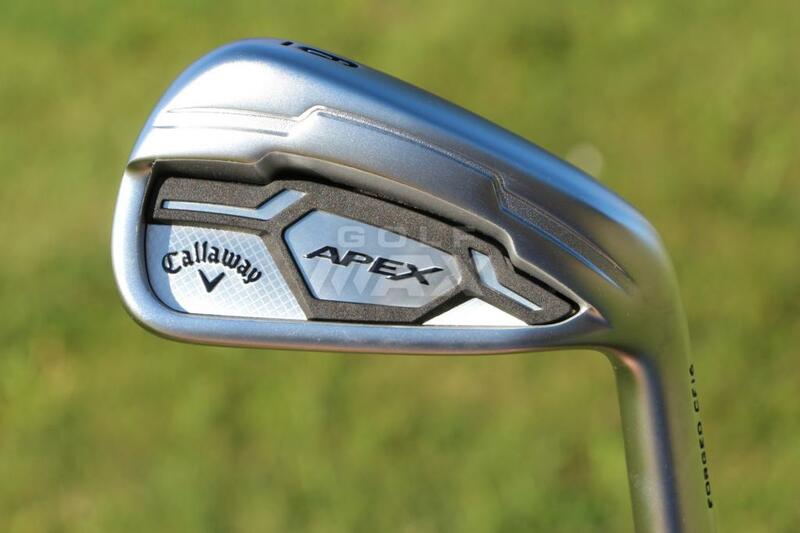 Game-Improvement Irons: Basically, medium-sized irons. This category includes a wide-range of clubs that blend distance, forgiveness, good looks and workability. Super Game-Improvement Irons: Basically, large-sized irons. 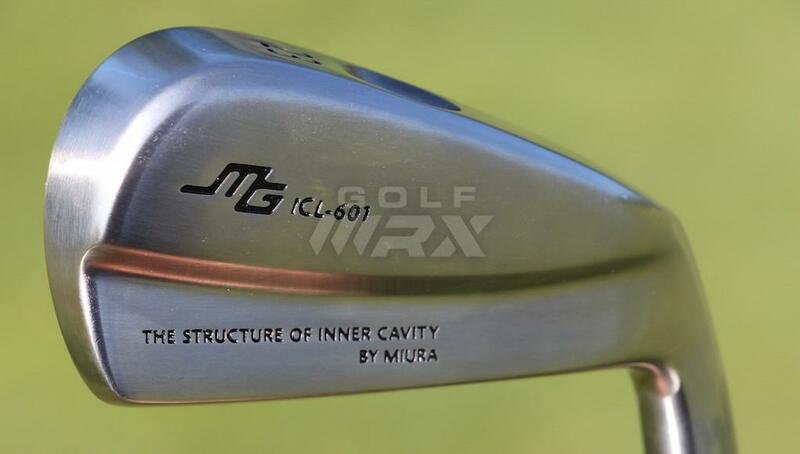 These irons are juiced with hot faces, wide soles, thick top lines, big offset and a low center of gravity, among other engineering feats, that are often unique to each company. Note: Because of the abundance of Players Irons currently available, we divided that category into two categories: Players Irons and Exotics Players Irons. 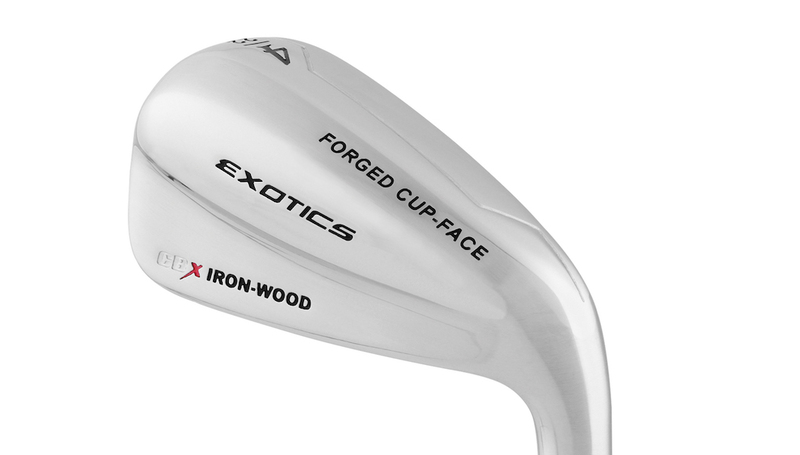 The Exotic Players Irons list included players irons from companies such as Epon, Fourteen, Miura, PXG, and Honma, which are not as widely available for testing in the U.S.
Below you can access the full results of our Members Choice 2017: Best Irons lists, as well as feedback about each iron from the GolfWRX Community. We’d like to sincerely thank all the GolfWRX Members who participated in the voting and provided feedback on the irons. We also want to thank those of you who provided feedback on the voting process itself. We assure you that we read and consider everything, and we’re going to continue to improve our process in order to provide the best and most useful information about the latest golf equipment. 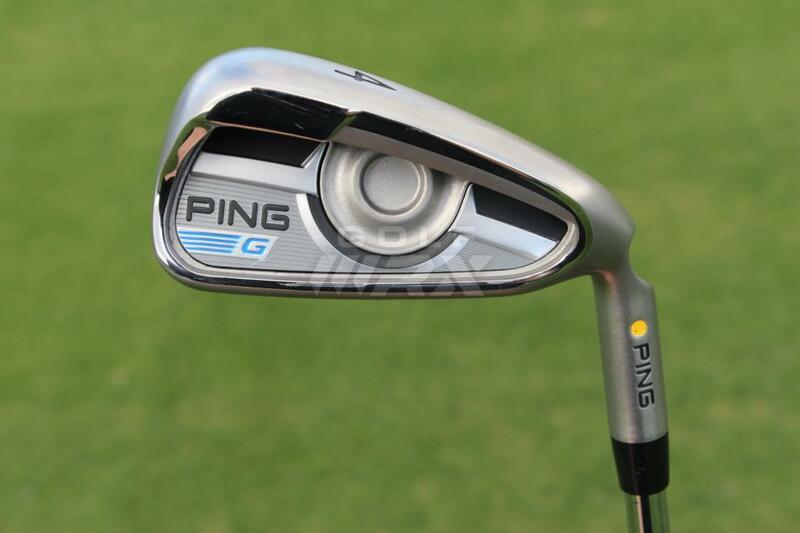 An iron that “will appeal even to Ping haters.” GolfWRX Members described the Ping G as “stupid easy to hit,” providing a “high and straight ball flight,” and “an eye opener.” The irons also accumulated more than 22 percent of the total votes in the category.